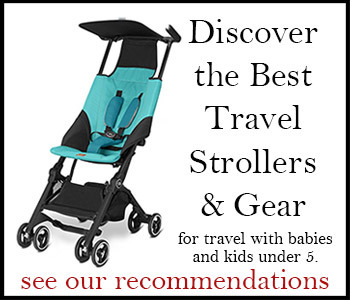 Wondering what to pack for a cruise with a baby or toddler? Rompers and onesies are great, a reclining travel stroller for deckside napping is wise, but be sure to also bring these important items on board, too! For a fee, Holland America Line will arrange for you to have commercial baby food, diapers, and a mini refrigerator in your cabin by advance request through the ship’s services department—you can preview the Holland America Line Infant Request Form here. Disney Cruise Line sells some baby essentials, including baby food, diapers, and wipes, on board all of its ships. However, they are only for sale “subject to availability.” As you can imagine, if every parent on the ship planned to buy diapers on board it could be quite a mess. In addition to the most basic supplies, you’ll want to bring along any baby bottles or sippy cups, toddler utensils, bibs, and related paraphernalia you may need to help make it a comfortable voyage. Just remember, as your supply of diapers and baby food diminishes you’ll be freeing up lots of room for souvenirs—which are much more fun to hunt for in port cities than diapers for your child. An inflatable baby bathtub can be very helpful in shower-only cabins. See Part VII: Travels by Cruise Ship in Travels with Baby: The Ultimate Guide for Planning Travel with Your Baby, Toddler and Preschooler.